I know, I know, you’ll believe it when you see it. We have seen the slippery, slimy Clintons escape everything thrown at them. In a defensive campaign I call “buying and lying,” Clinton insiders have maintained an ironclad loyalty to the Last Couple (I wonder how much one has to pay for such loyalty). We expected (or hoped) that one day, someone, somewhere, would appear and rat out the family that makes the Gambinos look like Ozzie and Harriet. Remember this name – Andrew Kessel, former Chief Financial Officer for the Clinton Foundation. Over the past year, Kessel and other unnamed Clinton Foundation whistleblowers have delivered 6,000 pages of evidence to the FBI and IRS. 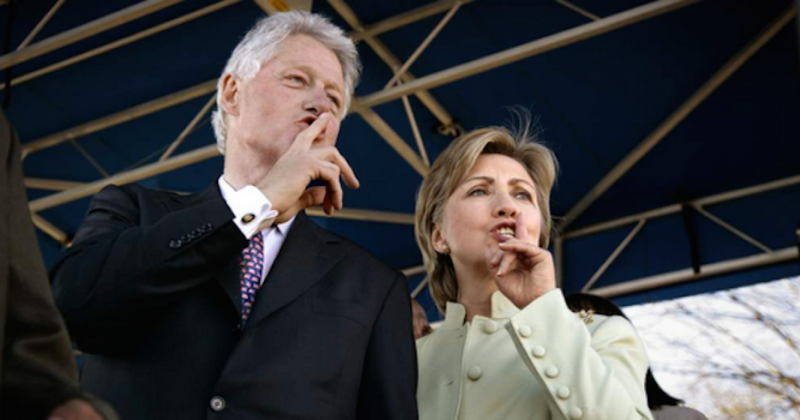 The reckoning for the Clintons I have dreamed of for a quarter of a century finally approaches with whistleblowing and documents about the slush fund known as the Bill, Hillary, and Chelsea Clinton Foundation. The ability of the Clintons to blow off charges of criminality will be crippled by the latest evidence revealed to be in the hands of prosecutors. With the former first couple humiliated by their inability to draw a decent crowd anymore, and plenty of other Democrats anxious to move on and put this embarrassment behind them, it is starting to look as though karma finally is catching up with them. John Solomon of The Hill reveals the story that has been percolating for a long time but kept tightly under wraps – because that is what serious prosecutors do, especially when grand juries are poring over evidence and issuing indictments that remain sealed until the right moment comes. The trigger for the story coming out now probably is a House subcommittee hearing scheduled next week by Mark Meadows, chair of the House Freedom Caucus, while the GOP still can set the agenda of House hearings. [A] GOP-led congressional subcommittee, led by Rep. Mark Meadows (N.C.), is planning to hold a hearing next week to review the work of John Huber, the special U.S attorney named a year ago to investigate all things Clinton. … internal legal reviews that the foundation conducted on itself in 2008 and 2011. Their own investigation! That’s hard to put down as politically motivated. Having the chief financial officer of the Clinton Foundation turn informant is a nightmare for the Clintons. The CFO has to process all the cash, and because that person usually is on the hook for any criminal violations, there is ample incentive to turn state’s evidence. This is very good news for those of us who have been frustrated at the ability of the Clintons to avoid prosecution over prima facie crimes while associates of President Trump are ensnared in process crimes and pressured to incriminate him with testimony some of them claim would be false. The hysteria ginned up by the Mueller investigation can be harnessed to focus on the Clintons, using the same techniques that the left has embraced when used against Trump. President Trump is very accustomed to calculating risk and is involved in a game of the highest stakes. He is looking for an opening to gain a little leverage. Right now he has very little. The Democrats and their faithful lapdogs in the mainstream media are keeping the momentum on their side. For every gum wrapper that Robert Mueller finds on the street and claims that Trump “did it,” the Democrat Communications Division, aka the mainstream media, blasts the impeachable offense from every rooftop, preventing the president from gaining the upper hand. Thus, the struggle continues while desperados like the Clintons and their henchmen walk the street as free men and women as the president’s men face serious prison time for not ratting out the president because there is no rat there. I know of something that would give President Trump the upper hand. If a million patriots would march on Washington and demand the prosecution of the Clintons, that grassroots support would get the attention of Congress and give the president the leverage he needs to put the swamp rats where all swamp rats belong – in cages. Let’s face it, in 2016 we captured lightning in a bottle. We elected the finest patriot to occupy the White House since George Washington (who actually never lived in the White House, but you get my meaning). We have two years for sure, and, hopefully, six, to capitalize on the lightning we have captured and return America to its former glory as the greatest, and more importantly, the most decent nation in the history of our planet. Our president needs us. He cannot fight this alone. We the People have a responsibility to take an active part in the salvation of our once-great nation. America will not be made great again without our active participation. Over the weekend, 290,000 angry French citizens demanded the resignation of their president who is hiding from them. The issue: high taxes. We, in America, are facing an even worse enemy, corruption so widespread in our government and so egregious that the perpetrators openly and arrogantly flaunt their criminality right in our faces, in broad daylight, knowing that they will get away with what they have done, and more. What makes them believe this? Because they know that the American people don’t care enough to stop them. Behind the shameless propaganda of the mainstream media and with operatives in every branch and agency of the federal government, they fight the one man trying desperately to save our country. And we do nothing to help! Will We the People respond as the French have, organize and actively demand justice? I don’t think so. But, in the meantime, we can be thankful for not-insignificant victories like potential justice for the Clintons.